Kaiteri House, sleeping four adults and four children, is perfect for a family holiday handy to iconic beaches and the Abel Tasman Park. Designed by Nelson architect Ian Jack, this pole house has 4 floor levels, high-pitched wooden ceilings and open plan living spaces. There are 3 bedrooms - 2 doubles (the master with ensuite) and the “attic” which is a favourite with children. The mezzanine floor, with sofabed, provides an extra space for a quiet read or children’s games. Two covered decks provide extra space to read, dine or play. Light and airy in summer, the house is warm and cosy in cooler months with a log burner and heat pump. The laundry and kitchen have everything needed for a pleasant stay (apart from a dishwasher). The elevated site enjoys tranquility, abundant birdlife, and panoramic views over native bush to the main beach and Little Kaiteriteri, across Tasman Bay to Nelson and south to the ranges beyond Motueka. Kaiteri House is 1 km from Breaker Bay and Kaiteriteri Beach with its general store, restaurants, and children’s playground. Access to the beach is by road, or (for the adventurous) via a rough walking track from the section. Famous for its beaches, Kaiteriteri is a place for all seasons. Swim, water ski, hire a kayak, try out the mountain bike park. 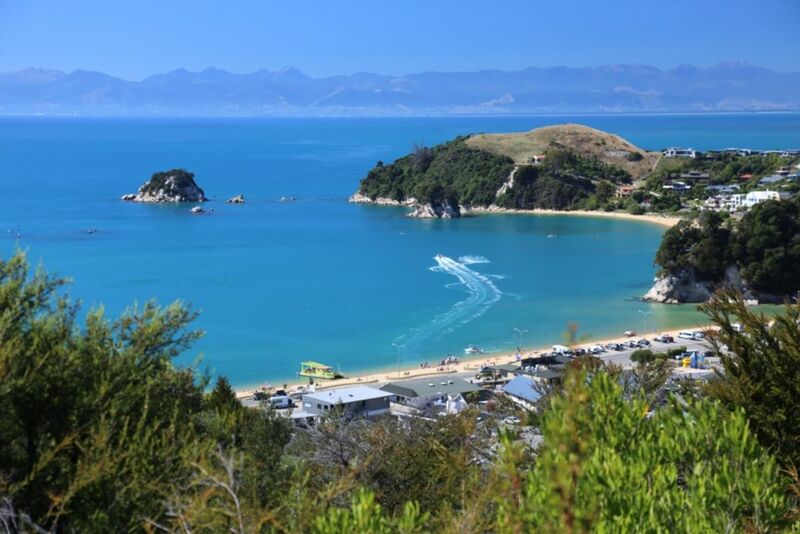 Take a day trip by boat into the famous Abel Tasman track. In the evening, BBQ on the deck, take in the views and sample a local wine or craft beer. House best suited to 4 adults and four children. Rates negotiable depending on length of stay. Please inquire. No parties; no smoking; no pets. Take care with young children around stairs. Adults be aware of the low sloping ceiling in the attic bedroom. A professional cleaning service is used. A cleaning fee applies. Guests must leave property tidy. Linen is included at peak times. At other times linen may be hired. We are an active retired couple and really enjoy having guests stay at Kaiteri House. Drive on access. Secluded and private with splendid views. 10 minutes drive to start of Abel Tasman National Park. Great location, great house, great views. We will come back. Thank you very much for your comments and for leaving our home in tip top order. This is much appreciated and you are very welcome to return whenever it suits you. Our best wishes for the rest of your travels. This was a beautiful house with a fantastic view. It was very clean and organized. Thank you for letting us stay there. Thank you very much for your comments. We are glad you enjoyed your stay. Kaiteri House is in a fabulous position with a view to die for! It is very well equipped, extremely comfortable and spotlessly clean. There are lots of basics in the pantry and we were given a bottle of wine, milk and a jar of gorgeous jam as a welcome gift. We highly recommend Kaiteri House. Another fantastic and enjoyable stay at Kaiteri House! This location is a tranquil piece of paradise. Our family age was 78yrs to 7yrs and we all throughly enjoyed the stunning panoramic views. The house layout is outstanding with lots of nooks & crannies for quiet space if needed. On arrival the home was lovely & clean, the beds were comfortable and linen exquisite. Tui, Weka, Fantails & native wood pigeon provided great entertainment while planning which beach to visit next. Breaker Bay is our favourite!